Want to watch the free Photzy videos offline? 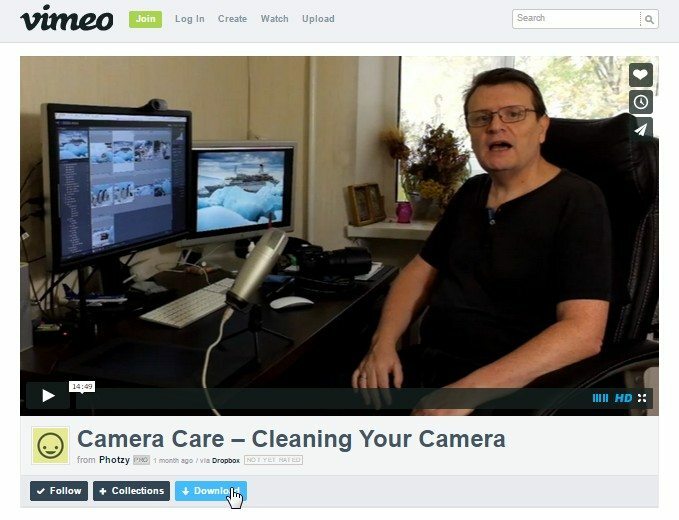 Our free video guides can be downloaded to your computer through our Vimeo page. You may access the page using this link. Note: The instructions below are for downloading to your desktop computer. For downloading to your mobile device, click here. Step 1: Access the Vimeo link provided above. You will be redirected to Photzy’s Vimeo page. Step 2: Find and click on the video you want to download. Step 3: Once it’s open, find the download button under the video title. Step 4: Click on the Download button and drop-down options will appear. You will have the choice to download either SD (Standard Definition) or HD (High Definition). Step 5: Click on your choice and the video will be downloaded to your computer, usually into your Downloads folder. Choose HD for higher quality videos.